Bring out your vehicle’s natural brilliance with Pinnacle polishes and the FLEX XC3401 DA buffer. The Pinnacle FLEX XC3401 Natural Brilliance Kit enhances the natural luster of your vehicle with Pinnacle’s naturally derived, scientifically enhanced products. The FLEX XC3401 Orbital Polisher helps your vehicle reach its shine potential by eliminating imperfections and restoring gloss. Find your vehicle’s true brilliance with the Pinnacle FLEX XC3401 Natural Brilliance Kit. Pinnacle products combine the best that nature and modern surface science have to offer into simple and effective car care products. These concours quality formulas enable anyone to achieve a show-stealing shine on his or her vehicle using the basic principles of clean, polish, and protect. Pinnacle expands car care basics into a full car care system that results in a cleaner, shinier, slicker vehicle than you ever imagined. The Pinnacle FLEX XC3401 Natural Brilliance Kit gives you the tools and products to achieve your vehicle’s own natural brilliance. This blue foam pad has soft composition for applying glaze, finishing polish, sealants, and liquid waxes. The soft pad has no cut, making it perfect for applying nonabrasive products evenly. Apply Pinnacle Liquid Souveran™ Wax with this pad. The Pinnacle FLEX XC3401 Natural Brilliance Kit is a complete polish and protect system. Start with a clean vehicle. Use Pinnacle Advanced Swirl Remover and the orange pad, followed by Pinnacle Advanced Finishing Polish, which can be applied with the orange or white, depending on your desired level of correction. Top off the clean, smooth paint with Pinnacle Liquid Souveran Wax for lasting protection and gloss. Maintain the shine with Pinnacle Crystal Mist Detail Spray. See our Dual Action Polishing Guide for more information on polishing with an orbital or DA polisher. 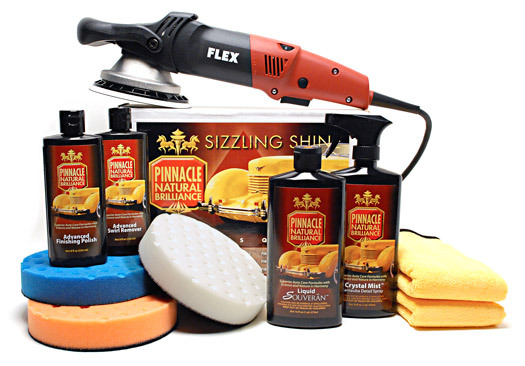 Use the Pinnacle FLEX XC3401 Natural Brilliance Kit to uncover your vehicle’s shine potential. A total retail value of $582.90. Save $112.91!